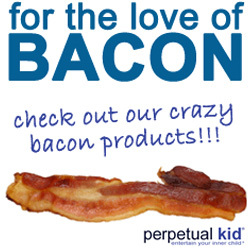 Not sure what to get the ultimate bacon lover in your life this holiday season? When a regular package of supermarket bacon shoved in a stocking just won't do, The Ultimate Bacon Lovers Gift Guide from MrBaconPants.com is gonna be your go-to guide. Whatever bacony goodness you decide to gift this year, make sure to wrap the package with some Bacon Gift Wrap to seal the deal.